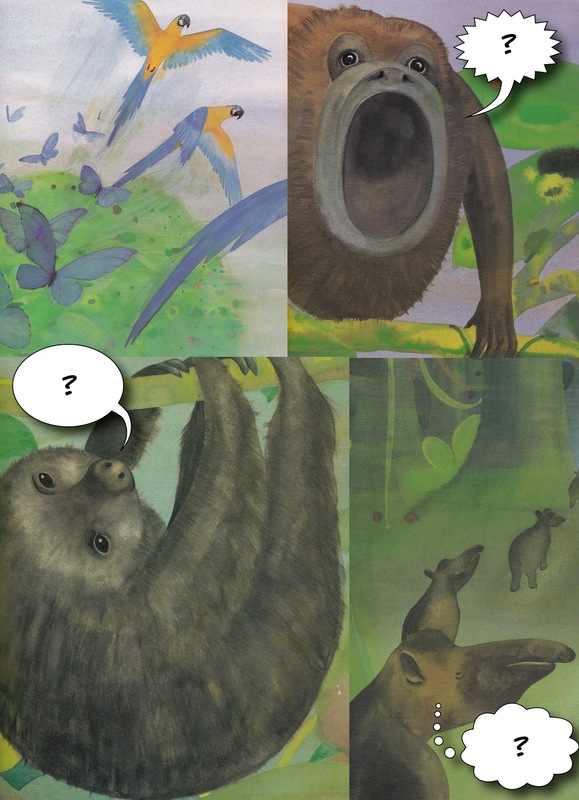 What do you think these animals (howler monkey, sloth, tapir, parrot and blue morpho butterfly) thought and said when they heard what the toucans had said? Remember to think about the characters of each of the animals and how this might effect their thoughts and speech. The Howler monkey, maybe screeching noises to signal other animals that Camouflaged danger is lurking nearby,or the howler monkey could be screaming because it's a wake up call to signal animals to move in a herd incase any lage groups of people are coming to chop down there habitat and rationed food. The Parrots maybe away to a new jungle to find more food in a different jungle, or they could be flying away because their habitat is falling apart and they are going far away to a safer spot.The sloth could be sleeping and might not hear the wake up call because they aer in such a deep sleep.The Tapirs maybe moving into a group den for the rain season because baby Tapirs were born and they had lots of then, so they had to build a new home. "this is a message to all of you in the jungle, the trees are falling down make your selfs safe and take the things you need,go to the close place you could see in the jungle! "the howla monky shouts with all his voice.the sloth says with the slowest voice in the jungle"i....am....being....as...quick....as...i...can....do....not....worry....."then the blue mopho butterfly says with terror"i cant fly higher than i can now.my wings are hearting realy badly"
the firs animal to hear it was the howler monkey he disided to warn evry single animal in the animal kingdom that there is some thing rong in the rainforest but he was not so sure why. The sloth heard the loud howler monkeys warning to and thought why is my branch shaking so much and what danger has that howler monkey spotted now.The tapars could feal the grown shaking he heard the howler monkeys warnig and saw some trees falling they had not a single word to saw because they were so terrorfied . The little blue morpho butterflys were more scared than all animals or bugs it was to ruth to fly in the air they kept on falling , crashing and hurting themselves. Howler monkeys are the well known loudest animal in the rain forest they can be heard from miles away. Did you know that when Howler monkeys are pregnant they wait thirteen months till the baby gets born.Howler monkeys are from tropical central and south america.Did you know that Howler monkeys can smell food from two kilometers, Howler monkeys normally walk on the edge of the branches to look at all the danger that is going on.Did you know that Howler monkey are 13.3 to 15.4 Ibs [6-7 KG].One of the howlers primary senses is its keen sense of smell. Did you know a sloth is so slow it grows moss and mushrooms on it.All sloths have three toes, but the two-toed sloth has only two fingers.Sloths are tree-dwelling animals, they found in jungles in central and south america.Sloths are part of the order pilosa so they are related to anteaters and armadillos Sloths are uasully 50 to 60 cm long. I think the howler monkey warned every body that people are going to destroy the jungle.When the animal heard the animals quickly ran but they stayed quiet because the knew the loucans would here them they were panicing so much they nearly ripped of there own heads before the loucans did.There minds were getting out of hand. One of the butterflies said to the other butterfly " i am going to faint" and then he fainted so one of the howler monkeys picked him up . The howler monkeys have brown skin they howl so loud and they howl so they can give alert to the other howler monkeys they have brown hair and eyes they howl 200 cm away they have a bone inside their neck that's why they howl so loud. Baby howler monkeys have bright skin but they are still brown. The Howler monkeys might be shouting at there loudest voice,the parrot might have been flying ourond telling the other birds to follow them,the butterfly might be flying out of the jungle and the tapair might be runing with its group telling them to hurry up. There was a storm in the rain forest it desroyed the toupcuns homes so they went to spread the word to the rest of the animals but the storm was coming closer and closer. The Howler monkey might be thinking"Why are they screaming so loud and what is going on is like the rainforest is gonna fall, oh well it might be raining so hard but I don't feel the water coming through the gaps of the trees. What if it's an earthquake and no one felt that the floor was even rumbling, wait a minute I think it's just something else I'm just gonna forget of all of what i thought in my mind." The Howler Monkeys would howl " Get out! Get out! Trees are being chopped down! Leave your house, we must leave now!" The Sloths would say nothing but they would've tried to get down as quick as possible. The Tapirs would say just protect each-other because now-one would listen to them. The birds told the other animals that they have to watch out because there is a jaguar on the loose so be careful, and the howler monkeys were signaling everyone with the howler monkey alarm.The sloth was thinking why would a zebra be in the giraffes section,but little did he know that the jaguar chased him there the tapir heard the zebra shouting "Panic and run!panic and run!" I think the sloths saying the rainforest is big that so many animals can fit in it it's safe for they can not get hurt themselves that they don't walk so much because they are so slowly for them to ran and they love swimming and there are very good at swimming. Habitat they live in South America at the Amazon forest and they live on trees and they like to sleep to much and they eat leaves to digest there food it takes on month to eat. And they to much food. The picture tells me that the animals are in a big danger in the jungle and they have To go to a place that will save them from the trees and they have to succeed.I predict that the animals are going to be starving when they move to another place then they will make up as a team and they will have as much as food in the end.